A great prototyping board for physical computing projects. With regard to battery monitoring, the header for the GPIO pins should be installed such that the wires from the header face the screen i.e. away from you - this should solve the issue. Do I have access to all GPIO pins on pi-top? With the use of our flagship development board the pi-topPROTO board, the user can have full access to all the Raspberry Pi’s 40 GPIO pins. The sky is the limit for which projects you can create with this snazzy tool. How do I insert the micro SD Card? The SD card will hold the operating system (OS) that runs of the Raspberry Pi and all operating systems that are compatible with the Raspberry Pi are fully compatible with the pi-top and the pi-topCEED. We ship with an 8Gb Class 10 SD card. Where is my micro SD card? The micro SD is included with a SD adapter for both the pi-top and pi-topCEED when bought with a Raspberry Pi. What does pi-top come with? Sticky keyboard keys - what can I do? Can you pop the key off by lifting from the lower edge and checking if there is any debris below it? If it isn't debris could you send us some photos, as we might be able to fix this remotely which will be the fastest option. 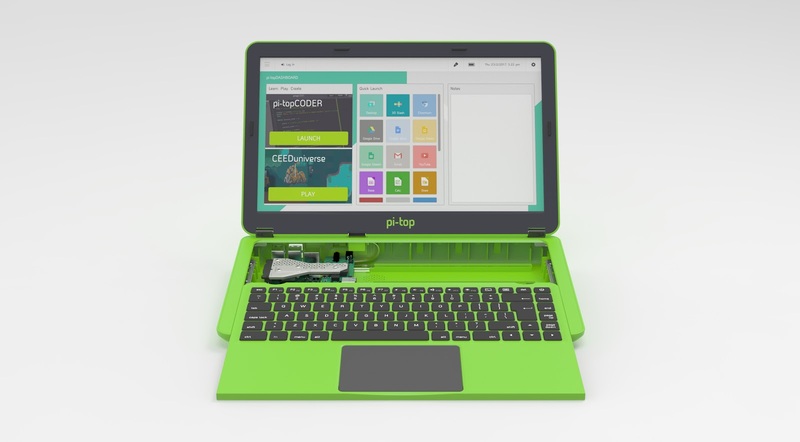 The new pi-top is a new generation of laptops. It’s a modular laptop and introduces an all-new sliding keyboard. It’s powered by the Raspberry Pi (optional), a credit-card sized PC. What trackpad does pi-top come with? The pi-top matte trackpad combined with robust dual-button design allows for a smooth interaction between the user and the Operating System. New pi-top: Who is the new pi-top for? We’re all young at heart, that’s why pi-top have developed a new range of exciting inventor journeys to awaken anyone’s inner child. So anyone from young musicians to explorers to scientists to software developers to inventors can do what they enjoy like they’ve never done before. The all new pi-top is for anyone. New pi-top: What colours are available for the new pi-top? New pi-top: What keyboard layouts are available? Currently, it is available as a US QWERTY keyboard layout. Additionally, it includes a free inventor’s kit so you can get started building, creating and inventing. You’ll get visual building instructions and an inventor guide with 20+ projects inside! The pi-topCODER app has step-by-step guides to complete hundreds of hours of projects. There are 3 inventor’s journeys - Music Master, Smart Robot and Space Race. You would only need to change the Thermal Pad if you are using Raspberry Pi 3B+. Older models of the Raspberry Pi do not require the Thermal Pad to be changed or removed. Carefully remove the existing thicker Thermal Pad (if necessary) from the Heat Sink. Remove the adhesive label from the thinner Thermal Pad supplied separately and affix this squarely on top of the Heat Sink as detailed in the pamphlet.